Collectors Facts - Four Leaf Puff Box, Contemporary Carnival (ALIG). Courtesy and copyright Martin Chaffee. Extract from ALIG catalogue, 1982-83. We were able to identify the puff box as an item that was made by Arthur Lorch Imperial Glass ("ALIG") in 1982-83. The colour was their Sunburst Yellow Carnival - product code SYC. It appeared in their catalogue as #42581 SYC. 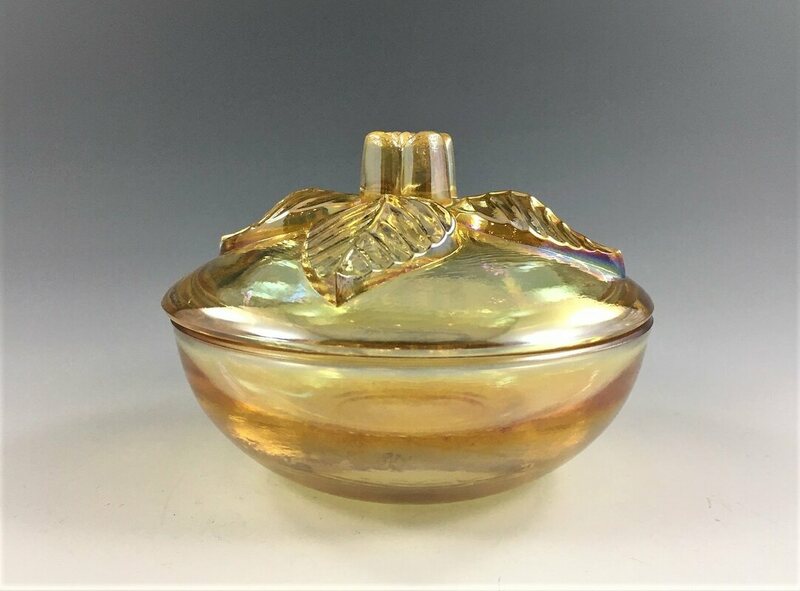 ALIG described their Sunset Yellow Carnival Glass as "Shimmering iridescence and sun sparkled hues are a winning combination for Imperial's new line" and also that items in this colour were "authentically reproduced from original moulds" with "the new ALIG hallmark to enhance collectibility". Above: the ALIG mark in the centre of the puff bowl.